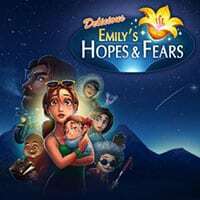 Join Emily and Patrick on an epic journey to save their daughter’s life in Emily’s Hopes And Fears Game! In the new title of the popular time-management series, the family is out for a lovely picnic when daughter Paige suddenly falls ill with a mysterious disease. Can they find a cure in time? Enjoy and have fun. Emily’s Hopes And Fears Game is one of our Time Management Games at Round Games. To play even more free games, view our most played and all games pages. If you want to play more games like this game: Then you can simply check out the games inside the game tags that are the most relevant to your interests. Or check the Time Management Games category or check the related games section at the end of the game page. Also make sure to check out Delicious Emily Childhood Memories Game, you may enjoy playing it.